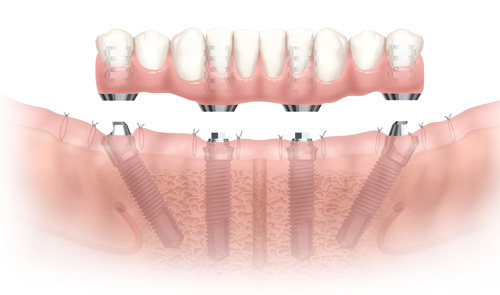 All-on-4 is a revolutionary technique where a denture or a bridge is fixed on to only 4 implants. This means that treatment can be completed all in one day. There are many different names for All-on-4, which include: teeth in a day, same day teeth, and same day smile. Having the perfect smile is very important in a world that is increasingly image conscious. In the past, having a large amount of teeth replaced could be a lengthy process involving long waits and many implants placed in your mouth. All-on-4 is different because you can have a set of replacement teeth in place in just one day with only four implants needed. Dental implants are a long established solution for lost teeth and basically involve having a socket placed into the gum into which a crown can be placed. This crown can then support a bridge of other replacement teeth. All-on-4 utilizes dental implant technology but is different because it can give patients a whole new set of teeth using only four implants. 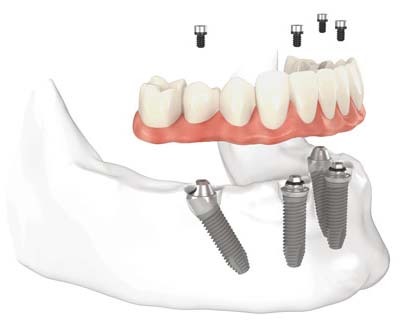 It is able to do so by placing two of the four implants at such an angle that the bridge is supported by the implants at the front of the mouth, where the jaw bone is denser and stronger. Please contact our office if you would like to set up a free consultation!